Botcherby is one of the most disadvantaged wards in Cumbria. The Community Centre suffered extensive damage during the floods and was forced to close. £15,000 was awarded from the Cumbria Flood Recovery Appeal, to continue supporting the local community from a temporary location at Petteril Bank Community Centre. Many residents in the area were flooded themselves and staff from the community centre were determined they would not be further disadvantaged by losing the community centre. They have continued to provide activities for the local community, and groups that use the centre have been relocated to other venues. The building itself still remains closed for repairs and is due to be re-opened early in 2017. Helen Fisher, Centre Manager, said: “During the stressful period following the floods, the grant allowed us to continue providing our services to the community, which has proven vital to many residents who have been flooded. People needed a place to come together on a regular basis and have some sense of normality. “One of our members doesn’t leave the house, other than to attend our weekly pensioner’s lunch club. Being able to continue this vital service from an alternative location has made a significant difference to the life of this elderly person, who would otherwise have become isolated. 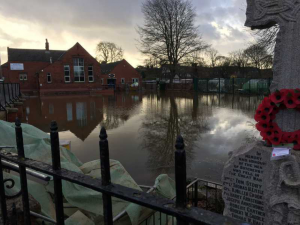 Botcherby Community Centre has since received another £45,000 from the Cumbria Flood Appeal towards further staff costs, resilience measures against future flooding and to replace damaged equipment.